Clean and Classic Interiors » Blog Archive » The Pleated Poppy Giveaway! So cute! Love to win! Yes they are gorgeous…I would love to win some. Although it would be hard for me to give them away since I loves me some flowers on my shirts. I love all your favorite things! How Fun! These would solve a few of my gift giving dilemmas this year! Thos pins are adorable! I can think of lots of ways to use them and friends that would love them as a gift too. I’d LOVE to win these gorgeous pins! Thanks for the great giveaway! Oh, and I am a newsletter subscriber - love it! The pins are precious!! Would love to win! How cute! Love the newsletter! Hope it’s my lucky day! I think it would be great if you could keep those in the family. Wink Wink. The newsletter was so fun to read! Lots of great ideas! I love those posies. Wouldn’t one be great on a little girl headband or bow? Embellish a scarf or little wristlet purse? Oh, the possibilities! These are so cute!! I could see them on so many things–shirts, bags, hair bands. Fun!! I also subscribe to the newsletter!! Cute stuff! I just subscribed to the newsletter too. I would love to have those fun pins in my possession…. I will win. I’m so confident! I was so excited to see your newsletter come out last night! Excellent work! 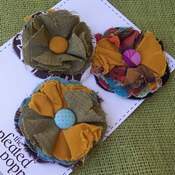 I love the pleated poppies!! I’m in! These are so sweet! These are so cute!! 3 of them will be perfect, one for each one of my daughters. Enjoyed the newsletter and love the Pleated Poppy pins! 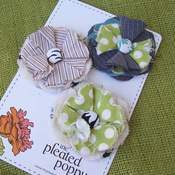 Love the Pleated Poppy! Great giveaway! 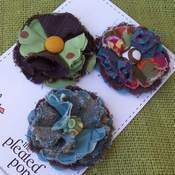 I love the posy pins! I would LOVE to win! Love these Posey Pins. So adorable for dressing up just about anything! These are sooooo cute. My girls would love them too. I really, really, really want to win.